We understand your frustration at the issues that occurred throughout your experience. We never want our customers to be disappointed in our services, and we would like to know more about your experience. Unfortunately, we cannot locate your account with the information posted here. Please message us at customersupport@empiretoday.com with your account information, so that we can follow up with you. 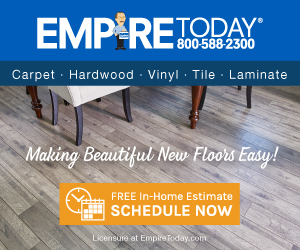 Although Empire Today has great deals for carpeting and flooring their costumer service was absolutely horrendous. They called Friday to confirm our carpeting installation and said that they would call Saturday between 7am and 9am to tell us when they would install the carpet. 9:30 passed by and I was very confused why they didn't call. So we called costumer service and were on hold for a half hour, only to find out that they didn't have the carpet. They said that they would call back to find out more but another 2 hours went by and there was still no call. I called customer service again another person answered and said that he could reschedule our installation but no one knew if they even had the carpet. At this point I was so angry and frustrated, I tried calling our sales consultant but he wouldn't answer so I drove to the place. Long story short I 100% wouldn't go to this place, I would stick to locally owned businesses that actually give respect to their customers. Review #891685 is a subjective opinion of User891685.